When I was a kid, here's how we took a family vacation: we'd pile into my stepfather's station wagon, pick a direction, and start driving. We'd stay off the Interstate highways, would eat at locally owned restaurants, talk to people, and go pretty much any place they told us was interesting. The "plan" was simply to see what we could see until the money ran out save for enough to see us home. One such vacation landed us at Disneyworld in Florida; but also took us to Silver Springs and to numerous roadside museums and attractions... the kind of "see the two-headed snake" tourist draws that haven't survived the decades. Another such vacation ultimately took us to Mammoth Cave. Along the way we lingered in the Blue Ridge mountains and Gatlinburg Tennessee; we visited the Oak Ridge facility where the atomic bomb was conceived; and made our way through the bluegrass hills of Kentucky. We took it into our heads on this trip that since we were so close to Wales anyway, we should go and visit Offa's Dyke. But it was late in the day, and the hills of Wales to the west brought the sunset a little sooner than we'd anticipated. Also, we weren't prepared for how utterly bereft was this portion of England of amenities like pubs, petrol stations, and restaurants. We found ourselves on a long section of the A4110 with nothing on it but hedgerows and silence. And overcast night gave us pitch blackness save for the twin pools of light cast by the headlamps of the Grenada. Grateful for a small sign that read "Farmhouse B&B", we coasted to a stop, hoping we'd have enough fuel to get us to a town the next day. The B&B was run by a former London clockmaker and his wife who had retired to the country. The farmhouse was huge, with a fireplace in which you could easily roast a pig. Upstairs were overstuffed feather beds, of which we thankfully availed ourselves after a quick bite graciously prepared on short notice by the lady of the house. Stronghold of the Mortimers, now a romantic ruin. left the site looking exactly as it did before the work began. The next morning when my wife and I awoke, the fog was just beginning to lift; another 10 feet and you could begin to call it clouds. As it was, it actually formed a perfectly flat misty ceiling just even with the top of our bedroom's southern-facing window. Below that ceiling the air was perfectly clear and evenly lit by the diffuse morning light. And below that window was a gorgeous garden of roses. To our left this gave way to truck garden that provided the vegetables for our evening and morning meal. As we were admiring this view, the clouds continued to ascend, and we could see the Welsh hills rising to our right; and as the clouds cleared them, they unveiled the ruins of a castle atop the hill. You could not have planned this. You could not have properly appreciated it if you had planned it. It's the kind of delightful surprise that you can only achieve through sheer dumb luck. 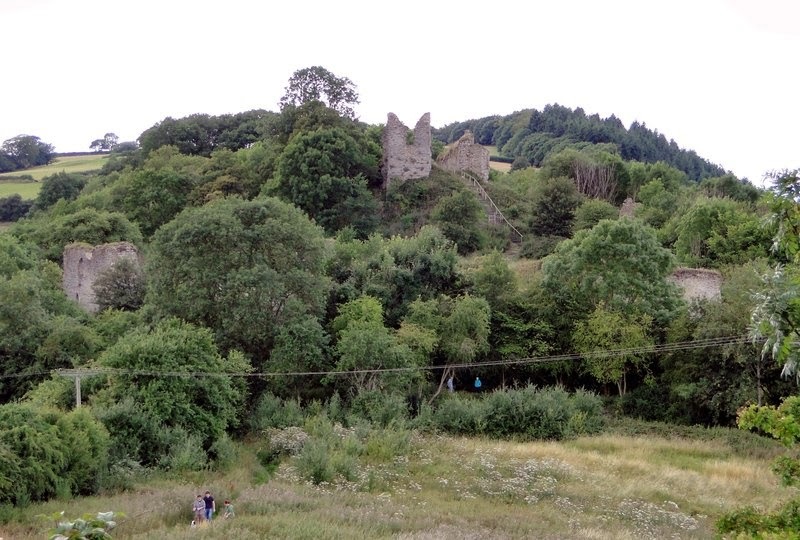 The castle, we learned, was Wigmore Castle, once besieged by Henry II. At the time of our visit it was for sale and unimproved. All that remained a few free-standing wall fragments among debris and sediment and a bit of dungeon. From the English Heritage site I see that it's much the same today as it was then. We clambered up the hill and took some photos, one of which framed the B&B through one of the few remaining windows. When it was developed, my stepfather sent it to the owner of the place in the form of a postcard. I'd post a copy of it here for you if I had it. That's what I grew up appreciating: unplanned, spontaneous fun. And once you have had a taste of real freedom, there's really no suitable substitute. I've been on other vacations of the sort that I'm told that normal people take. The kind where plans are made, reservations are booked, and schedules are kept. The kind where a checklist of events is kept and meticulously attended; where a time-boxed quota of fun is allotted for each event, and if you miss a checkbox you are not only off-schedule, but you've lost fun. The kind where you can measure and precisely describe the amount of fun you will have missed out on should you not keep to the schedule. The kind where you can't just go where whim and curiosity would take you. The kind where the allotment of fun must be adjusted by a factor representing the stress induced by keeping to that damnable schedule. The kind with no genuine wonder and no genuine surprises. The kind that feels a lot like a job. It's not just holidays and vacations that can be like that, you know. It's parties, too. My idea of an ideal gathering is one where there might be a purpose and some general idea of getting together, and maybe even a few planned events; but the bulk of which is largely unstructured so as to allow people to mingle and converse and do and go where they will. The kind with a buffet and few rules. I'm not nearly so fond of those where there is a schedule that says you must arrive at such-and-such a time sharp and finish your meal, ordered well in advance, mind you, at just this time so that you can take part in this specific set of activities with this particular group so that we will all have carefully constructed and managed fun. "Mandatory fun" (a phrase we first used in the military, but which has since spilled into business). I know that a lot of people like it, and that I am probably quite atypical and anti-social. I'm sure I must have some deep-seated psychological disorder that gets me focused on my dislike of the format and keeps me disengaged. Basically, it's a lot like work to me. As you might surmise, when it comes to my entertainment I'm more into meandering than traveling with purpose... "Meandertory fun", if you will. And that's why I'm writing this instead of attending the company Christmas party. One more reason to stay out of jail.